I'm home today staying inside while Hurricane Sandy passes through the Northeast U.S. It is inevitable that the last of our fall leaves will surely be knocked down with the wind gusts we're expecting. Goodbye Fall, we will miss you. The perfect crisp days, baseball playoffs (kudos to our Washington Nationals and the San Francisco Giants who kept the post-season fun) and of course the gorgeous display of Mother Nature's fall colors. Every time I drive down the GW Parkway this time of year, I'm reminded how great the East Coast is in the Fall. Before we start thinking about holiday decorations, I wanted to share one last peek at my fall doorway decor - a wreath from The Enchanted Florist (my local go-to shop for all my wreath needs - love those gals!) hangs on the antique lion door knocker I picked up in Portugal this past April. I enlisted the help of our friend, and calligrapher extraordinaire, Michele from Meant to Be Calligraphy to spruce up the white pumpkins. Inviting, right? 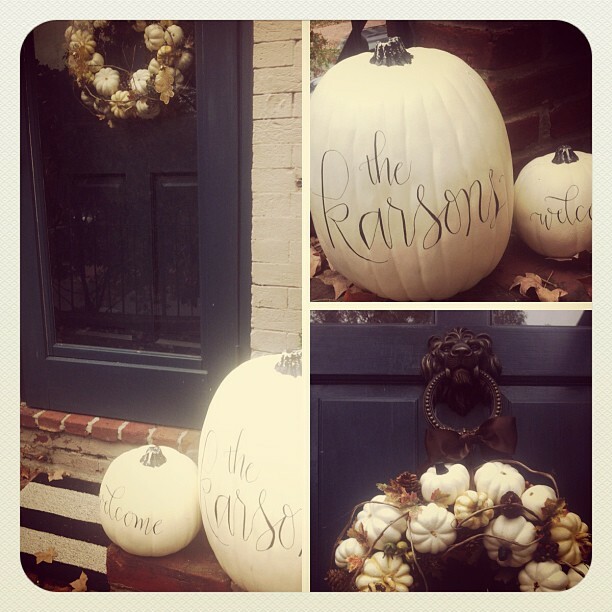 Love the way the pumpkins finish off the look! Too bad they are now safely inside the house as we wait out the storm! Love that wreath! So stylish.